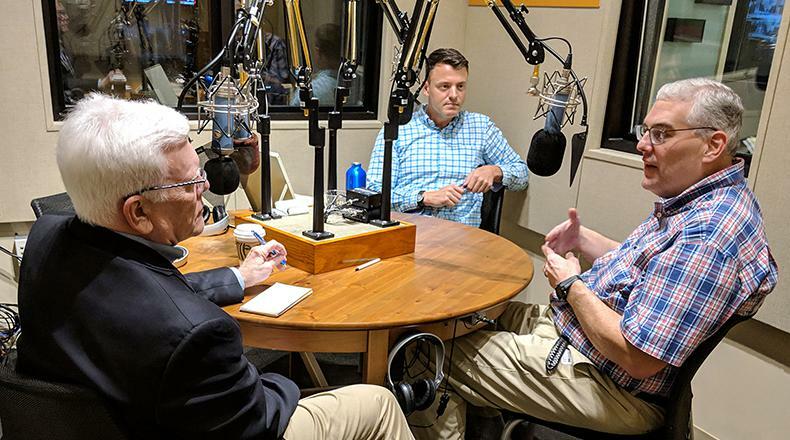 Gavin Jackson speaks with Russ McKinney (l) and Jeffrey Collins (r) in the South Carolina Public Radio studios on Monday, April 8, 2019. Then, Russ sticks around to quiz Gavin about South Carolina history in this week's Did You Know segment. On this edition of South Carolina Lede, recorded live at Seminar Brewing in Florence, SC, host Gavin Jackson gets an update about the 2020 election from the Associated Press' Meg Kinnard and the Post and Courier's Jamie Lovegrove. The three look at the current slate of Democratic presidential hopefuls visiting the Palmetto State as they compete for their party's nomination. Then, South Carolina Public Radio's own Russ McKinney quizzes Gavin and the audience about Florence history. On this edition for the week of March 28, 2019, host Gavin Jackson takes you to recent campaign stops by Democractic presidential candidate Beto O'Rourke and potential candidate South Bend, Indiana Mayor Pete Buttigieg.